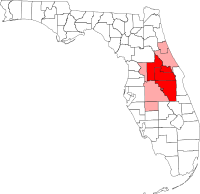 Four Corners, also known as Citrus Ridge, is an unincorporated suburban community and census-designated place (CDP) in the U.S. state of Florida, located at a quadripoint formed by Lake, Orange, Osceola, and Polk counties. The population of the Four Corners CDP was 26,116 at the 2010 census. Four Corners is located at 28°20′1″N 81°38′33″W﻿ / ﻿28.33361°N 81.64250°W﻿ / 28.33361; -81.64250 (28.333701, -81.642451). In the CDP, the population was spread out with 19.9% under the age of 18, 7.8% from 18 to 24, 33.5% from 25 to 44, 25.1% from 45 to 64, and 13.7% who were 65 years of age or older. The median age was 37 years. For every 100 females, there were 98.4 males. For every 100 females age 18 and over, there were 96.8 males. Osceola County Fire Rescue operates Station 71 in Four Corners. Polk County Fire Rescue operates Station 42 (on U.S. 27 just south of U.S.192) and 33 (on Ronald Reagan Blvd just East of U.S. 27) in Four Corners. Lake County Fire Rescue operates Station 112 in Four Corners. Orange County Fire Rescue operates Station 32 in Four Corners. Residents of that section are zoned to: Keene's Crossing Elementary School, Bridgewater Middle School, and starting in 2017, Windermere High School. Residents were previously assigned to West Orange High School. ^ "Profile of General Population and Housing Characteristics: 2010 Demographic Profile Data (DP-1): Four Corners CDP, Florida". U.S. Census Bureau, American Factfinder. Archived from the original on September 11, 2013. Retrieved September 21, 2012. ^ "Geographic Identifiers: 2010 Demographic Profile Data (G001): Four Corners CDP, Florida". U.S. Census Bureau, American Factfinder. Archived from the original on September 11, 2013. Retrieved September 21, 2012. ^ "Bing Maps". www.bing.com. Retrieved 2016-10-17. ^ "Station 71." 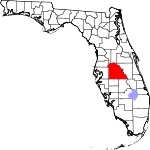 Osceola County. Retrieved on April 19, 2017. " 8706 W. Irlo Bronson Memorial Hwy. Kissimmee, FL 34747"
^ "2010 CENSUS - CENSUS BLOCK MAP (INDEX): Four Corners CDP, FL." U.S. Census Bureau. Retrieved on April 22, 2017. Map pages: 1, 2, 3, 4, 5, 6, 7, 8, 9, 10, A01, B01, C01, D01. ^ "Keene's Crossing Elementary School Zone." Orange County Public Schools Office of Pupil Assignment. February 20, 2015. Retrieved on April 21, 2017. This page was last edited on 22 January 2019, at 01:00 (UTC).